Oriflame Review: Catalog-based pay to play since 1967? Oriflame operates in the personal care, apparel and nutritional supplement MLM niches. 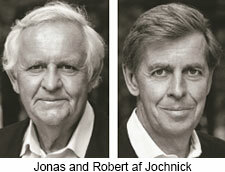 The company maintains corporate offices in Switzerland, although it was founded in Sweden in 1967 by Jonas and Robert af Jochnick. Today Oriflame is headed up by CEO and President Magnus Brännström (right). Brännström has been with Oriflame since 1997. According to an executive profile on Bloomberg, Brännström srated out as Managing Director of Russia. He was appointed Regional Director for the CIS, Baltics and Asia in 2001, before assuming his current position in 2005. It’s worth noting that Oriflame is a publicly traded company on Nasdaq Nordic. Primary shareholders include Robert, Alexander, Jonas and the af Jochnick family, the Trygg Foundation and the Swedish National Pension Fund. On the regulatory front, Oriflame was recently fined in Vietnam for failing to implement required refund policies and procedures. Other than some minor tax issues in Russia, the company otherwise doesn’t seem to have run into regulatory issues. Read on for a full review of the Oriflame MLM opportunity. On their website, Oriflame claims it “add(s) 300 new products annually” to its range. We take an innovative and creative approach when developing products. We use the best of science and design and are always in pace with the latest trends and fashion. And we never compromise on quality, safety or value for money. Specific product categories marketed by Oriflame include skin care, color cosmetics, fragrances, personal & hair care, accessories and wellness. With hundreds of products on offer, there are naturally far too many to cover here in detail. Oriflame do however provide a full product catalog for each country they operate in (over 60 apparently), complete with localized retail pricing. For some reason Oriflame don’t provide a copy of their compensation plan to the public, even on their localized websites. I did however manage to find a copy of the “Success Plan”, uploaded to Oriflame’s investor relations website earlier this year. This copy of the compensation plan is labelled “leaders edition” and is the basis of the analysis below. 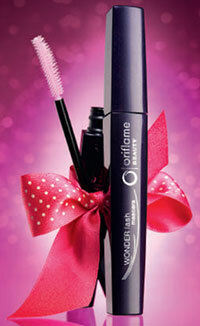 Oriflame affiliates earn a 30% commission on products sold to retail customers. The Performance Discount, despite the name, is a bonus paid on individual and downline Business Volume (BV). Each Oriflame product has a corresponding BV value, which is tallied up when an affiliate purchases the product or sells it to a retail customer. The Performance Discount is paid out as a percentage of personal and personally recruited affiliate monthly BV generation. Note that the Performance Discount is a coded bonus, meaning a maximum 21% is paid on all generated BV. Affiliates who qualify for a higher Performance Discount rate than their immediate downline also receive the difference between their rate and that of their downline. E.g. if you qualify for a 12% Performance Discount one month and one of your personally recruited affiliates only qualifies at 3%, you receive the 9% difference on their Performance Discount calculated BV. When a personally recruited affiliate reaches the 21% Performance Discount rate, a flat 4% is paid on their generated BV. Note that to qualify for the 4% Oriflame Bonus, an affiliate must maintain 7500 GV. GV stands for “Group Volume” and is BV generated by an affiliate and their immediate downline. If an affiliate’s monthly GV drops below 7500 but above 3000 GV, they receive a reduced 4% Oriflame bonus (specifics not provided). If an affiliates monthly GV drops below 3000 they fail to qualify for the 4% Oriflame Bonus for that month. Finally there’s a “minimum guarantee” applied to the 4% Oriflame Bonus, which guarantees qualified affiliates a share of their downline BV. If the downline BV affiliate generates less than 7500 BV a month, some of their earnings are stripped and paid to their upline (provided they qualify for the 4% Oriflame Bonus that month). The amount stripped is enough to pay the upline the “minimum guarantee” 4% Oriflame Bonus. The Gold Bonus is a single-generation 1% bonus that is paid out via a unilevel compensation structure. The Gold Bonus is paid on second level downline that qualify for a 21% Performance Discount, up to another downline affiliate in that leg also qualifying for the Gold Bonus. If no such affiliate exists in that particular leg, the Gold Bonus is paid out the full depth of the leg. To qualify for the Gold Bonus, an Oriflame affiliate must recruit and maintain at least two 21% Performance Discount qualified affiliates and have at least 3000 GV a month (your PV and that of the affiliates you personally recruit). A minimum guarantee applies to the Gold Bonus, stripping downline affiliates who fail to maintain 7500 GV a month of up to $32.50. The Sapphire Bonus is a repeat of the Gold Bonus, starting from the third level of each unilevel leg. The Sapphire Bonus pays 0.5% of generated volume on any unilevel leg that qualifies for a 21% Performance Discount, starting from the third level (the bonus starts on the third level, the affiliate on level 1 has to qualify for the 21% Performance Discount). The Sapphire Bonus is paid on each qualifying leg up until another affiliate in that leg is found who also qualifies at the Sapphire level. To qualify for the Sapphire Bonus, an Oriflame affiliate must recruit and maintain at least four 21% Performance Discount qualified affiliates and have at least 3000 GV a month (your PV and that of the affiliates you personally recruit). A minimum guarantee applies to the Sapphire Bonus, stripping downline affiliates who fail to maintain 7500 GV a month of up to $16.25. The Diamond Bonus is a repeat of the Gold Bonus, starting from the fourth level of each unilevel leg. The Diamond Bonus pays 0.25% of generated volume on any unilevel leg that qualifies for a 21% Performance Discount, starting from the fourth level (the bonus starts on the fourth level, the affiliate on level 1 has to qualify for the 21% Performance Discount). The Diamond Bonus is paid on each qualifying leg up until another affiliate in that leg is found who also qualifies at the Diamond level. A minimum guarantee applies to the Diamond Bonus, stripping downline affiliates who fail to maintain 7500 GV a month of up to $8.12. The Double Diamond Bonus is a repeat of the Gold Bonus, starting from the fifth level of each unilevel leg. The Double Diamond Bonus pays 0.125% of generated volume on any unilevel leg that qualifies for a 21% Performance Discount, starting from the fifth level (the bonus starts on the fifth level, the affiliate on level 1 has to qualify for the 21% Performance Discount). The Double Diamond Bonus is paid on each qualifying leg up until another affiliate in that leg is found who also qualifies at the Double Diamond level. A minimum guarantee applies to the Double Diamond Bonus, stripping downline affiliates who fail to maintain 7500 GV a month of up to $4.06. The Executive Bonus is a repeat of the Gold Bonus, starting from the sixth level of each unilevel leg. The Executive Bonus pays 0.0625% of generated volume on any unilevel leg that qualifies for a 21% Performance Discount, starting from the sixth level (the bonus starts on the sixth level, the affiliate on level 1 has to qualify for the 21% Performance Discount). The Executive Bonus is paid on each qualifying leg up until another affiliate in that leg is found who also qualifies at the Executive level. A minimum guarantee applies to the Double Diamond Bonus, stripping downline affiliates who fail to maintain 7500 GV a month of up to $2.03. Finding out how much it costs to join Oriflame is no easy task. Affiliate membership costs are not provided on Oriflame’s corporate website or their localized domains. There is mention of a “starter kit” but no associated costs. What we do know is each Oriflame affiliate has to purchase at least 200 BV of product each month to qualify for MLM commissions. There’s no suggestion of how much 200 BV of product translates to cost-wise in the Oriflame compensation plan. With the benefit of an established MLM company comes a strong community and refined marketing plan. Oriflame brand their marketing system “SARPIO”, which stands for “Sales and Recruitment Processes in Oriflame”. SUCCESS FORMULA: SHOW EACH NEW CATALOGUE AND TAKE ORDERS FROM AT LEAST 20 REGULAR CUSTOMERS! Catalogs, both online and physical, appear to be the primary method through which Oriflame products are marketed. The company comes out with a new catalog each month, which can be obtained in digital format direct from the company. Finding out Oriflame don’t force their affiliates to purchase catalogs each month was definitely a relief. What due-diligence for Oriflame boils down to is what the focus of their SARPIO system is. Specifically, is it retail sales or recruitment? To be clear, there’s constant reference to retail sales (customers) in Oriflame’s marketing material in compensation plan. There’s also plenty of focus on recruitment too. Personally recruit one Consultant per week and continuously stay in personal contact with new and established Consultants. Make sure sponsors duplicate your efforts and grow into Leaders. What tipped the balance for me was the mandatory 200 PV a month purchase imposed on Oriflame affiliates participating in the MLM opportunity. In order to qualify for any Oriflame bonuses, you must maintain a minimum personal purchase volume of 200 BP in that catalogue period. This doesn’t negate retail sales taking place in Oriflame, but does create a strong focal point for those in the business towards recruitment over retail. Personal recrutment is essential, the more often you do it, the faster you will grow. Our success in Oriflame is due to the fact that for many years now we have had a clear rule – to tell 10 people every day about the opportunities that come with Oriflame, to conduct 2-3 opportunity meetings per day and to provide all newcomers with our support and motivation. 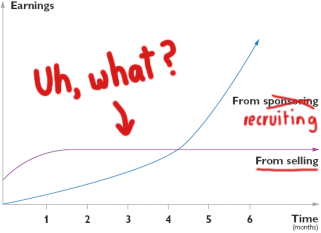 We spend about 80% of our time on recruitment. That’s pretty damning, more so coming from affiliate leaders within the company. If they’re not focused on retail sales, why are their downlines going to be? And remeber, everybody in Oriflame is supposedly following the same SAPIRO system. There’s not supposed to be any deviation. Oriflame claim that if you start asking people to sign up as affiliates, that ‘at least one in five will say “yes”‘. Not only does this constitute a potential misleading representation from Oriflame corporate, it also creates the idea that recruiting Oriflame affiliates is simply a numbers game. Ask fifty people to sign up as Oriflame affiliates and at least ten of them will. That’s not how the real world works. Results will vary wildly due to any number of factors, and Oriflame shouldn’t be making these sorts of representations or claims to new and potential affiliates. Having gone through Oriflame’s forty-seven page long compensation plan in its entirety, I get the distinct impression that the majority of commissions paid out are on 200 BV affiliate autoship. Why on Earth do retail sales flatline after just one month?! If accurate, that’s a disaster that Oriflame needs to address immediately. In performing my research for this review, I came across articles mentioning a possible Oriflame expansion into the US. The articles were published in 2016 and Oriflame entering the US, central and South America “within a few years” is a common theme. Here’s the thing though, two years later and Oriflame has launched in Chile, Colombia, Ecuador, Mexico and Peru… but not the US. Perhaps having observed the FTC going after Vemma and Herbalife for being pyramid schemes, Oriflame has gotten cold feet. Seemingly like Oriflame, affiliate autoship chain recruitment was central to both Vemma’s and Herbalife’s business models. The obvious solution would be to scrap affiliate mandatory purchases and have only retail volume count toward the 200 PV requirement. It is unlikely Oriflame will get rid of the 200 PV requirement, seeing as its used to qualify for Diamond and higher bonuses. That bonus qualification drops from 7500 GV a month to just 200 PV (the minimum purchase required for MLM commission qualification) for a higher ranked bonus, is telling. As a prospective Oriflame affiliate, what you’ll want to immediately find out is whether your upline is generating at least 200 PV a month in matching retail volume. What they do or don’t do with products they’ve purchased doesn’t count mind, you should be able to see verified retail order volume of at least 200 PV. Anything less and you’ve confirmed that particular Oriflame affiliate is participating in a product-based pyramid scheme. If that’s widespread enough throughout Oriflame global affiliate-base, and I have no reason to believe otherwise, then Oriflame has some serious compliance issues to tackle. Or not. I couldn’t help but notice each quoted “global leader” in Oriflame’s compensation plan is from a country in which MLM regulation is rather weak (Turkey, Colombia, Serbia, Russia, Mexico, India, Kazakhstan, Mongolia, Spain, Indonesia, Egypt, Ukraine and Estonia). I might be reading too much into it but there’s probably something in that. Indeed that was a math fail on my part. Thanks for catching that Otto. I don’t see the issue with the sales chart which you comment “Uh, What?”. That chart would be the sales for one person and their downline. A single person would presumably have a certain number of customers they could service and then the cusrtomer churn kicks in. So, it might be 20 customers, 30 or 40 that a single affiliate could service. There will be a finite limit to sales generated by one affiliate, same as a sales person for any traditional business. e.g. if you can generate 5% more customers every month but you have (say) a 2% churn rate, at some point your sales will plateau. However, if an affiliate starts introducing other affiliates who do the same, then sales volume downline can indeed increase exponentially. 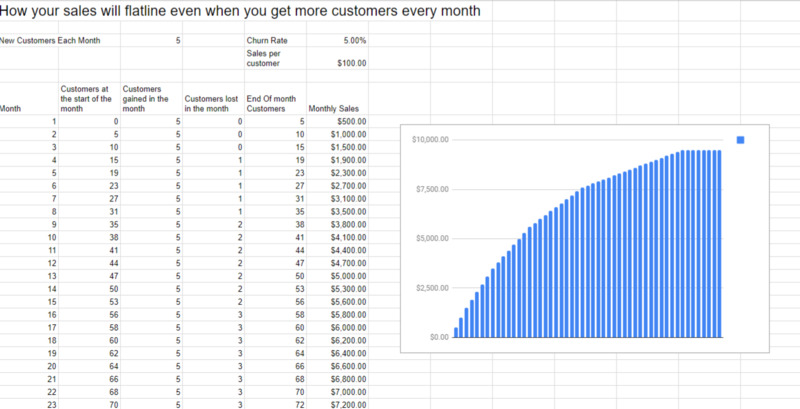 Here’s a spreadsheet that shows how sales will always flatline at some point when the personal sales rate matches the customer churn rate. The graph doesn’t indicate retail sales will plateau “at some point”. It clearly shows a plateau after the first month, which is worrying. Moreso when you consider Oriflame consider affiliate purchases resold to affiliate purchases as “selling”. Looks an awful lot like someone signing up for autoship and then never doing anything else, doesn’t it? And even if it was actual retail volume, what legitimate business survives if their retail volume stagnated a month after opening? It was a fairly generic graph they provided and I would imagine most people would read it that way, but perhaps I’m wrong. But yes, it you took it literally then of course 1 month until sales plateaued (actually 1.5 months on their chart) would be of some concern for most business ventures. If you took my chart and relabelled the months as days, you’d get the same chart so I still think it’s all about timescales etc which is why I interpreted their graph as an illustration of the concept rather than actual sales figures. Of course, if their sale volume is entirely due to sales to other affiliates then indeed they are operating a pyramid scheme, but if each affiliate is producing a good quantity of personal (customer only) sales then I would class them as a legitimate affiliate scheme. How we get hold of that level of data I don’t know. But then you’d be recruiting 5 customers a day spending $100 a day. The general point is uncontroversial. If your job is sales on commission then there are so many customers you can pitch to in a day and eventually income will flatline. To achieve a continually increasing income you need to get the salespeople working for you – to be an entrepreneur. That applies to pretty much any job, the only difference is that with commission-based jobs you get an initial upward curve followed by a flat line and with a salaried job you just get a flat line. The con is the idea that signing up to an MLM makes you an entrepreneur. I won’t preach to the converted about why that’s complete Horlicks. An enterpreneur has some kind of system, capital or asset that enables people to enhance the value of their labour by working for them. An MLM participant has f-all, other than shoddy goods and the inherently flawed maths of pyramid schemes (you just need to recruit 6 people and then they need to recruit 6 people etc etc). So in summary the graph is a con, but perhaps not for the reason that Oz’s annotations suggest. The con is the suggestion that any MLM participant will experience the endlessly upward curving line when in reality 99% of them will experience a flat line at the bottom of the y-axis. I’m unaware of how to read data on a graph other than literally. If Oriflame don’t want to represent an average flatline of retail sales after just one month then they shouldn’t be putting that data out there. If the data is accurate, that certainly is concerning and Oriflame needs to promptly address why retail sales flatline so quickly. So Oriflame need to change the word “months” to “time” on the chart and that would be acceptable? It makes no sense to have a specific x-axis and a non specific y-axis. I think flatlining retail sales and presenting that to new affiliates in any capacity is resignation. When a business starts accepting limits they aren’t going to grow.